Hoppers and dumpers are pieces of industrial equipment that are used to collect, store, and transport bulk materials. If you are maintaining a plant or trying to keep your jobsite clean, hoppers and dumpers can help you do that. Most hoppers and dumpers have built-in fork pockets so that they can be easily accessed by forklifts and other types of lift trucks. These types of equipment may also be made portable due to many different hopper caster options. Below are some of the different types of hoppers and dumpers that the S. W. Betz Company carries and has dealt with in the past. The S. W. Betz Company has a long history of distributing hoppers and dumpers for some of the top manufacturers in the industry, including Jesco. 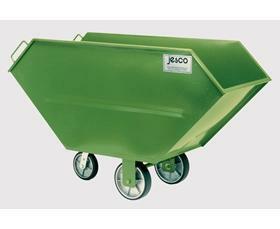 Jesco is located in Litchfield, Michigan and has been manufacturing quality hoppers and dumpers since 1932. If you are in need of or would like more information on any of our hoppers and/or dumpers, please contact us and one of our team members will be happy to assist you. For more information about Hoppers & Dumpers or any other product or service from S.W. Betz, fill out and submit the form to the right.